I'm not normally one to shop the Nordstrom Anniversary Sale. Although it seems like every blogger is talking about the sale nonstop when July rolls around, I personally don't think that the deals are that great. However. 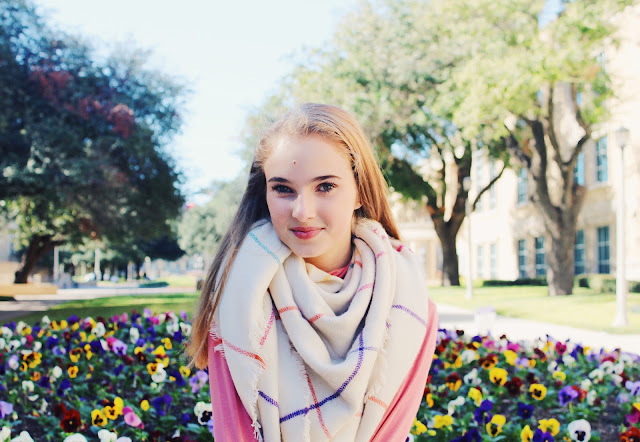 This blanket scarf is the exception to that rule. When I came across this scarf back in July, I knew I had to have it. I love blanket scarves (have I made that clear yet?) but this one was so unlike any other one I'd seen. 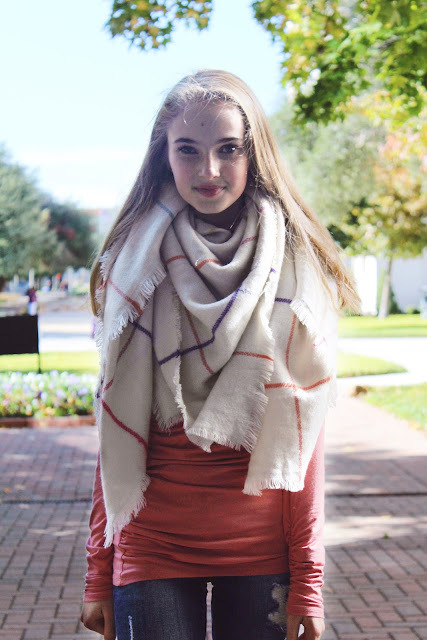 Most blanket scarves come in your traditional fall hues - burgundy, olive, taupe, the likes... but this one adds a fun pop of color to any winter wardrobe! 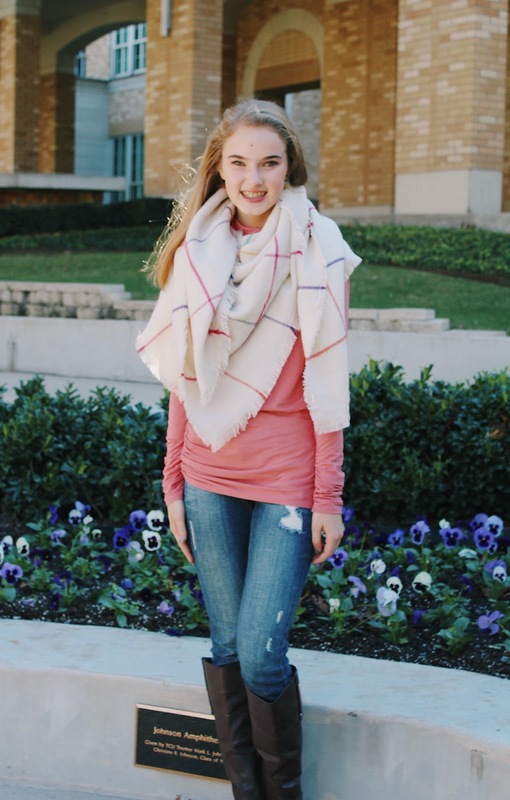 I wore this outfit while touring TCU with my family last week. I was so impressed with their campus, especially the journalism department. I met the dean of communication, and she was kind enough to give me an informal tour of the journalism building. I was blown away by all they had to offer - a student-led radio station, an advertising department, a student newspaper, and broadcast journalism... the list goes on! I could definitely see myself attending TCU one day. We also grabbed lunch at Pizza Snob on campus and had dessert at Susiecakes, the cutest little bakery! 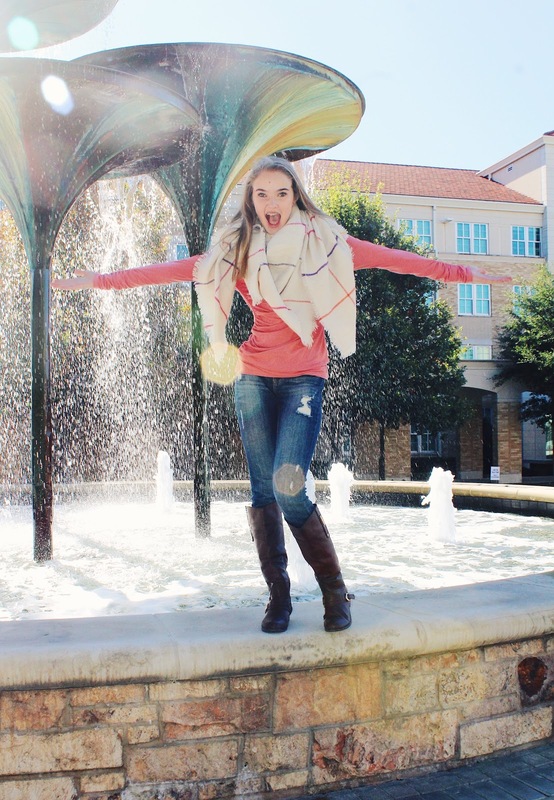 It was such a fun day and I loved getting to explore another beautiful college campus (see pictures of my UT visit here & SMU visit here). I love decorating for Christmas. My mom, grandma, and I decorated for Christmas last Friday, and it made me so happy to pull out all of the Christmas ornaments and decorations. 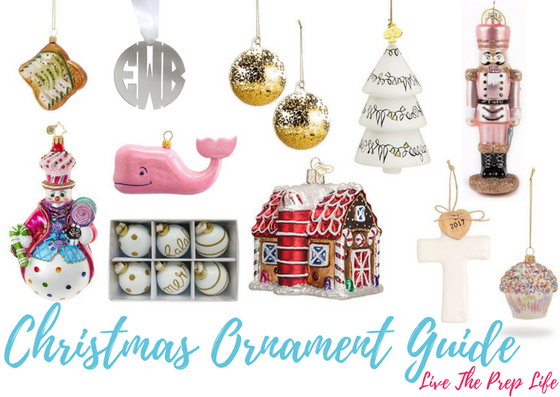 Today I'm keeping the gift guide theme going by sharing some of my favorite ornaments of the season. These are great if you're participating in any ornament exchanges, want to give a small gift to someone, or are in the market for some new ornaments yourself! Enjoy! It's always really fun to me to go ornament shopping and find the craziest, most unique ornaments - like this avocado toast one, for example. I think it's so cool to build a collection of fun ornaments like those throughout the years! Another favorite of mine would be this snowman - it's way out of my price range, but we can all ooh and aah over how pretty it is! In my experience, World Market, Sur La Table, Anthropologie, Target, and Altar'd State all have great selections of ornaments. If you'd rather go ornament shopping in person, I'd highly suggest looking there first! Which ornament is your favorite? Where do you buy your Christmas ornaments? Let me know by leaving a comment below - I'd love to hear from you! Interrupting today's regularly scheduled content to bring you the best of the best Black Friday sales! Today is the perfect day to stock up on Christmas gifts for your family and friends, all while indulging in leftover pumpkin pie & putting up Christmas decorations. I've included a bunch of my favorite picks from each store to make your shopping a little easier. Enjoy! everything is 50% off & fuzzy socks are only $1! 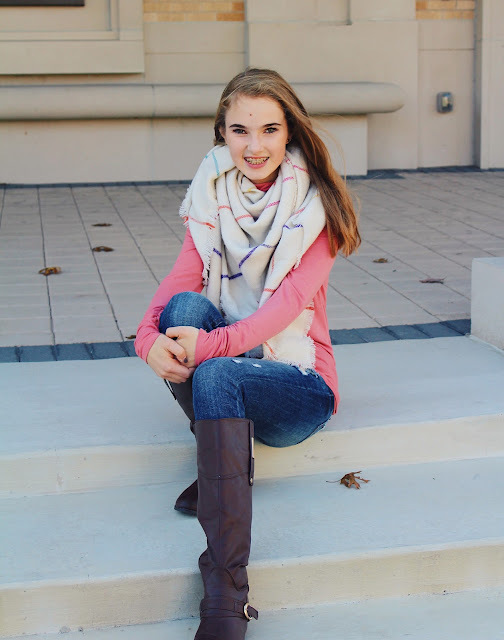 LAUREN JAMES | deals vary, but pretty much everything is on sale! 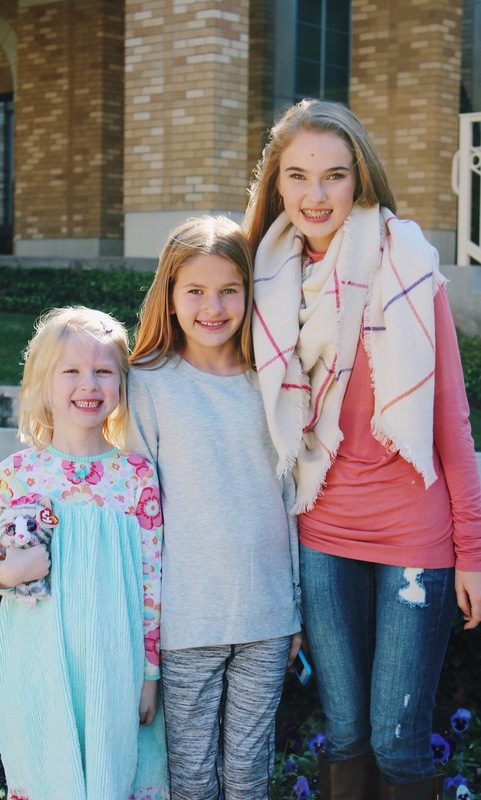 It's become a tradition here on Live The Prep Life that every November, I make a list of things I'm thankful for, both big and little. This year is no exception; in honor of Thanksgiving being tomorrow, I'm sharing 100 things I'm thankful for. These things range from obvious (my health) to small and random (fuzzy socks), but they're all things that shouldn't be taken for granted and are important in some way to me (because seriously. fuzzy socks are the best.) In no particular order, I present to you: 100 things I'm thankful for! I hope this list reminds you to be grateful this Thanksgiving and maybe even inspires you to make a list of your own! If you do, I'd love to see it, so definitely send me a link if you make one! Have a great Thanksgiving filled with food, family, and fun! 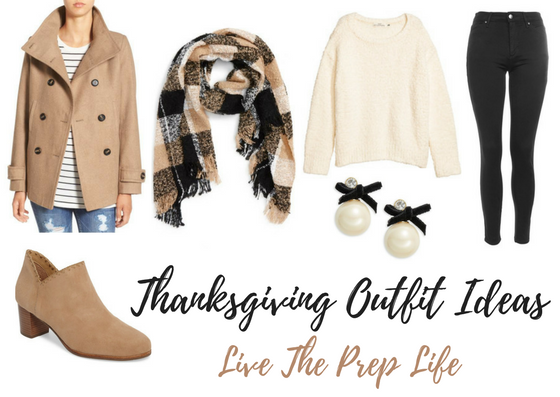 I am so excited to announce that the holiday season has officially begun here on Live The Prep Life! While I am usually very adamant about enforcing the "no-Christmas-before-Thanksgiving" rule, I'm making an exception today because I have so much Christmas content that I want to share with y'all, so I better get started early! Plus, I know that a lot of y'all are doing your Christmas shopping right now, so I wanted to give you plenty of time to utilize my gift guides. Here's the schedule for the upcoming month: Every Monday, I'm going to be sharing a gift guide with y'all. Each one will have a different theme/topic. Then, on Wednesdays, I'm doing regular blog posts such as outfit posts. Lastly, on Fridays, I'll have my usual rotation of Link Love, Currently, and Life Lately posts. Oh, and I'm doing Vlogmas, too! All on top of studying for midterms and doing all the quintessential Christmas activities. Is December going to be hectic? Yes. Am I putting wayyy too much on my plate? Yeah. But is it worth it? HECK YES, because I love Christmas and want to share as much Christmas spirit as I possibly can! Okay, enough rambling. Let's get on into the gift guide! I love participating in Secret Santa exchanges, but it can be tricky to find a good gift to give, especially if you don't know the person that well. I've tried to find some items that pretty much anyone would love, and I've kept them all under or around $25 since most Secret Santa exchanges have some sort of budget. Obviously, if you're doing a Secret Santa with coworkers and you're finding a gift for a guy, most of these might not apply, but I think any girl would love these! P.S. - you can check out my gift guides from previous years here! A lot of the products might be sold out, but I'm sure you could gain some inspiration and find similar products. Happy shopping! Happy Friday! Today is an especially exciting Friday because I have Thanksgiving Break next week, so I'm looking forward to nine days full of festivities, food, and family! 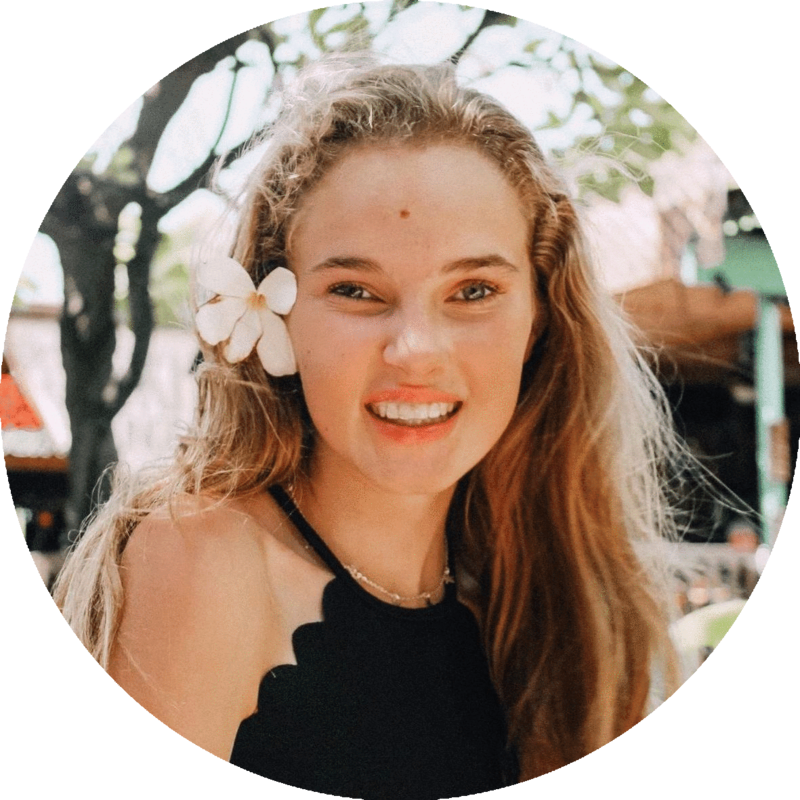 I'm going to try to keep the introduction to this post pretty short and sweet, so let's go ahead and get into the post - I've rounded up some of my favorite links from around the web lately, so I hope you enjoy! 1 // PSA: Freeform relased their 25 Days of Christmas schedule! 2 // Wondering what to do with that random 1/2 cup of pumpkin you have left over from all your fall recipes? 3 // Shelby is so pretty in this sweater + skirt combo! 4 // So many Christmas gifts under $25! 7 // Kate has rounded up a bunch of holiday dresses for all price ranges! 10 // Gabby visited New York and all of her pictures look so fun! 12 // Target stores are getting a makeover, and I love their new design! It's been really interesting to follow their process of rebranding. 16. How fun is this flare sleeve sweater? It's such a good price, too! 17 // Mackenize's wedding photos are simply gorgeous! 18 // These pearl riding boots are definitely an investment, but so pretty! ALSO - I'm currently planning out all of my holiday content! If you have any blog post or YouTube video requests, email me or leave a comment letting me know! 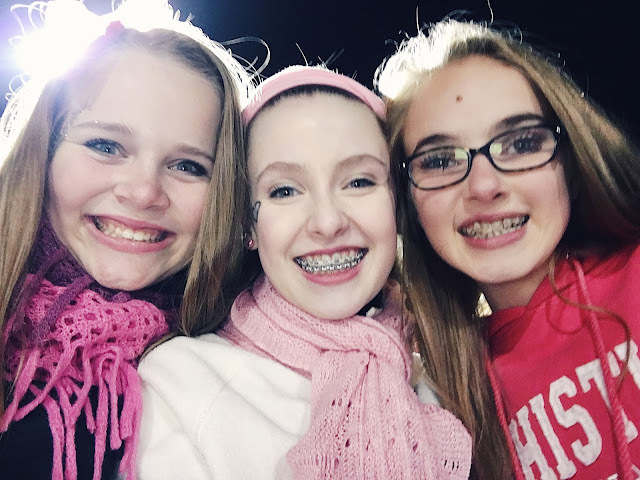 Have a great weekend + Thanksgiving break!! It's no secret that fall is my favorite season for fashion. I love all the subdued tones, layered items, cozy sweaters... I could go on and on. 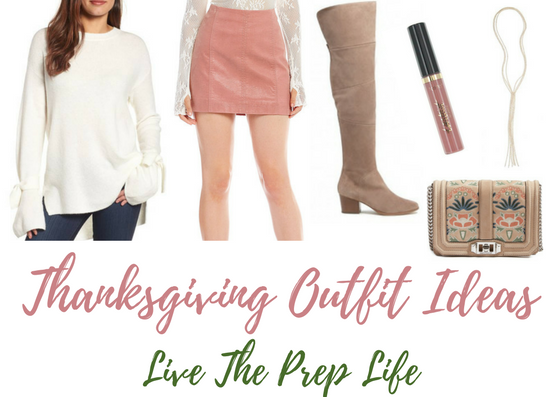 Today I've put together a bunch of different Thanksgiving outfit ideas for all sorts of occasions - these outfits range from casual to dressy and have everything in between! Enjoy! If you live in a cold climate, this outfit is perfect for you! Complete with multiple layers, it's bound to keep you warm during all your Thanksgiving Day festivities. For some reason, this reminds me of something you might wear to the Macy's Thanksgiving Day Parade - I'm not really sure why, but that's what comes to mind when I see this outfit! I absolutely love this outfit! 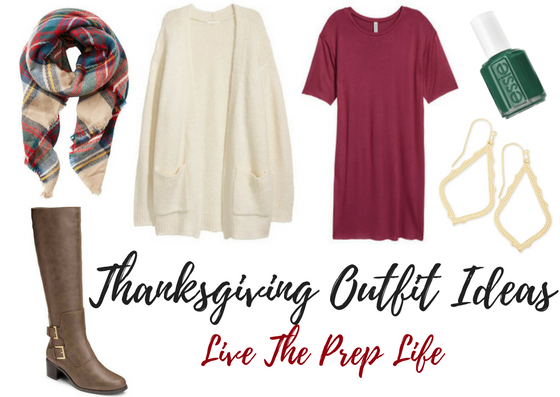 While its colors aren't exactly the most fall-queue hues ever, this outfit is put-together and nice, but it's not too fancy - perfect if you're having a small get-together with family and don't feel like wearing a dress. 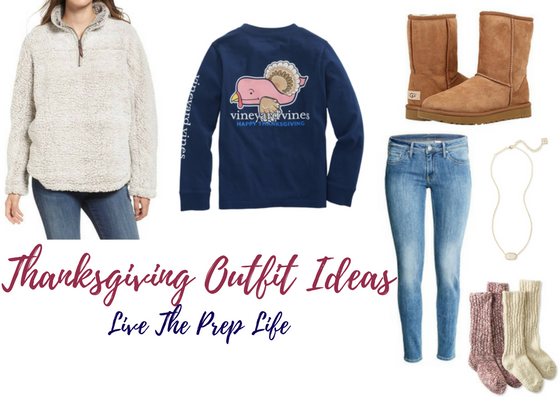 Let's be real - sometimes you just want to be comfy and cozy on Thanksgiving! If you're just lounging around the house, and don't feel like getting dressed up, this outfit is perfect for you. It's full of fuzzy components like this pullover and these boots, but the Thanksgiving t-shirt still allows you to be a little festive. 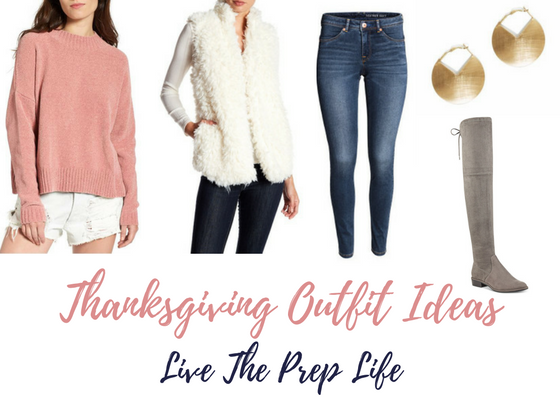 This outfit is probably my favorite of the five - I love how it combines some of this season's biggest trends! This bell-sleeve sweater would look perfect when paired with this burgundy skirt and some suede over-the-knee boots... I'm obsessed! Want more fall outfit inspo? Click here + here + here to see some of my recent outfit posts! Happy Friday! This week has felt so long, but it's been a good one because a) the weather was super chilly this week, b) I've made so many yummy pumpkin spice treats recently, and c) knowing that Thanksgiving Break is right around the corner keeps me going! I honestly love fall so much and it makes me so happy - as I'm proof-reading this post, I see so many exclamation points, but I honestly don't care because I've been in a really good mood lately! 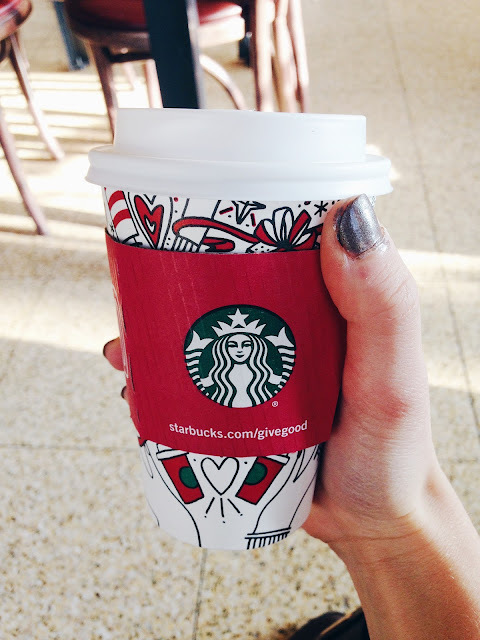 I had my first holiday drink of the season today and it was so good! Chestnut Praline Lattes are the BEST! Wanting... I have been wanting a button-front skirt for the longest time, and I love this suede one from Old Navy! It comes in three colors, and I can't decide which one is my favorite. I also keep meaning to order Chip Gaines' new book (also, while we're on the subject of Chip.. HE CUT HIS HAIR). Wearing... scarves! This week was pretty chilly, so I broke out my arsenal of scarves. I wore this one with my pink Hunter boots, this one in this blog post, and this one with a black shirt and black boots! 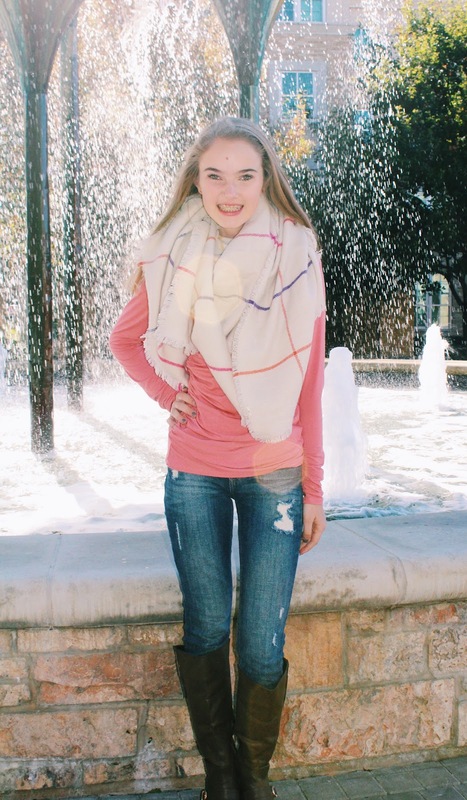 Scarves make me feel so cozy and put-together - they're my favorite winter accessory! Listening... to Reputation! I may or may not have stayed up last night for the release of Taylor Swift's new album, but it was so worth it because it's so good! She has such a wide variety of songs on the album, and they're all so different from what she usually does, but I'm obsessed with them all! Eating... Halo Top Ice Cream! It has been my new obsession lately - it's so good, and you don't feel bad eating the whole pint because it's pretty healthy. 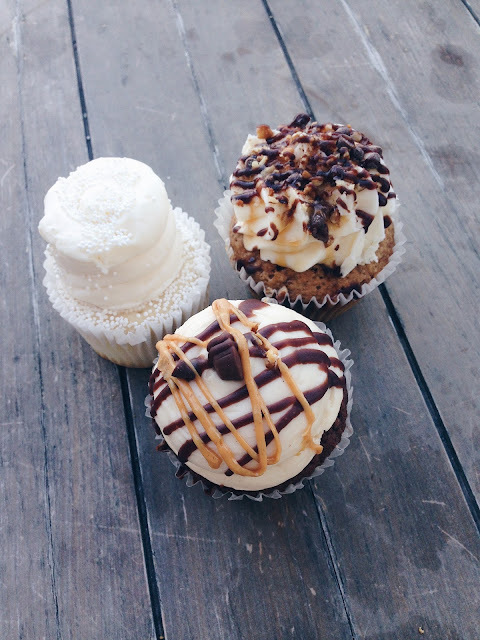 My favorite flavors are Red Velvet and Cookie Dough, but I really want to try Birthday Cake and Chocolate Peanut Butter! Watching... nothing at the moment. I want to start Riverdale, but I also want to start Stranger Things... and then Ashley has been telling me that I need to watch Friends. So I've resulted to watching nothing, because I'm indecisive like that. Also, the 300th episode of Grey's Anatomy was last night, and you know that I'm going to watch it the second I get home from school today! Buying... this concealer, these earbuds, and this top. I haven't gone shopping in FOREVER, but I have been doing some online shopping. I bought a new bottle of my favorite concealer after it ran out, a new pair of earbuds after mine broke, and this top, which sadly is not like the picture - but I guess that's what you get for ordering from SheIn. In my opinion, nothing beats a good movie night. I always enjoy making pizza or nachos with my family, starting a movie, and then pausing it halfway through to make some popcorn! I've always preferred TV over movies, but over the summer, I got really into watching movies and found a ton that I love. 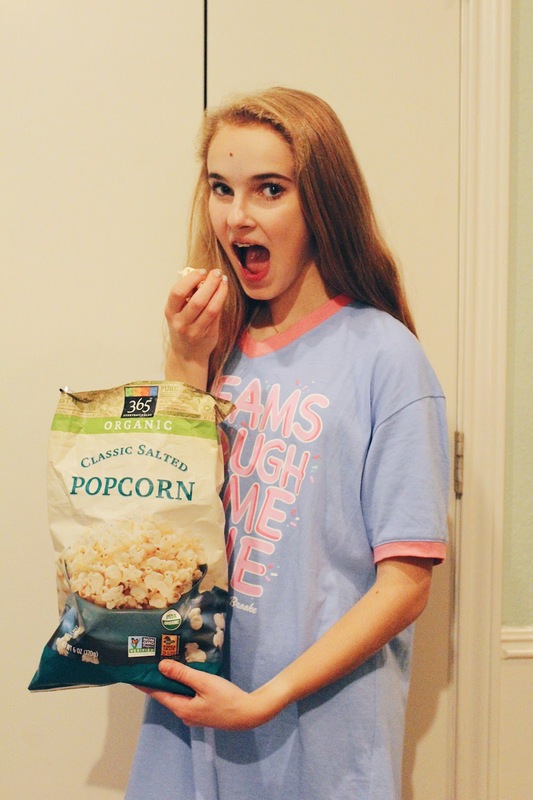 Today I'm sharing ten of my favorite movies with y'all to give you some inspiration for your next movie night - enjoy! Pitch Perfect // I had to start off this post with my all time favorite movie! Between the lively choreography, the hilarious situations, and the witty one-liners, I can't get enough of this movie. I've been counting down the days until Pitch Perfect 3 comes out, and I am beyond excited! The Parent Trap // If you haven't seen this movie, what are you doing with your life? I've seen this movie at least ten times, and I will never get tired of watching it. In case you live under a rock (kidding!) it's about two twins who were separated at birth but end up going to the same summer camp and decide to switch places. Can't Buy Me Love // Honestly, I'm just a fan of this one because it stars a teenage Patrick Dempsey (aka McDreamy) but the plot is still so good! Plus, it's available on Netflix, which is always a good thing :) It's your typical geeky-guy-becomes-popular flick, but it's so good! The Proposal // This movie is tied with Pitch Perfect for my favorite movie. I've watched this 3 times in the past 4 months, and it's so good. The romance and plot is so sweet, but it's also downright hilarious and I no matter how many times I watch it, I find myself dying of laughter. 13 Going on 30 // Also availible on Netflix, this comedy is about a teenager who wishes to be 30... and just like that, she's 17 years older and her whole life is upside down. I've seen this movie quite a few times, and it never gets old! Mean Girls // If you can't quote every line of Mean Girls, who even are you? JK, but for real, this movie is all kinds of amazing and another one I can (and will!!) watch over and over again without getting sick of it. The Devil Wears Prada // I watched this movie a few weeks ago, and I must have been really tired because I don't remember that much of the plot, but I do know that it was really good and I'll definitely be watching it again sometime soon! What are your favorite movies? I'm always looking for new ones to watch, so let me know in a comment below! It's crazy to think that I'm publishing my 30th volume of Life Lately today... time really does fly by! I love writing these posts for y'all, and I love looking back on old installments and seeing what my life was like a year or two ago. My Life Lately posts are usually pretty fun, if I do say so myself, and this one is no exception! 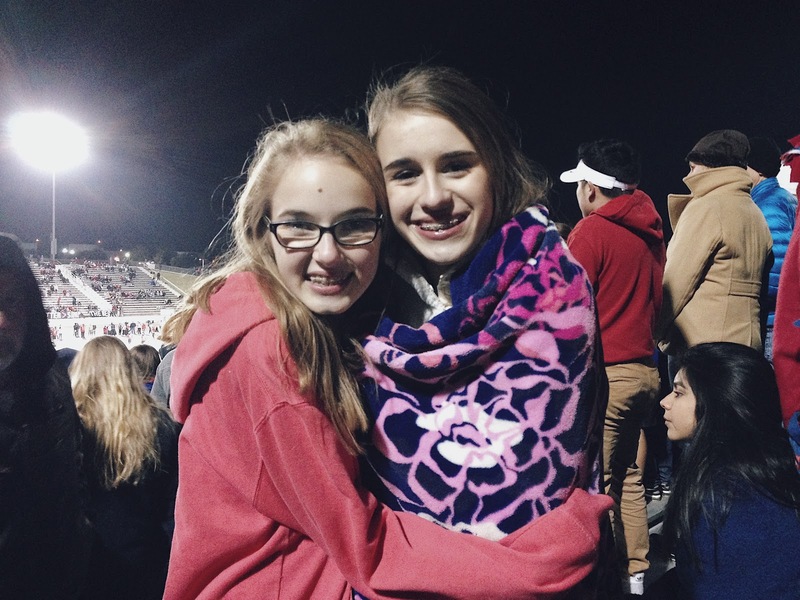 From Halloween, to football games, to Dallas day trips, it's been a pretty fun past few weeks! For Halloween earlier this week, Ashley came over and we ate a ton of Reese's peanut butter cups & s'mores!! 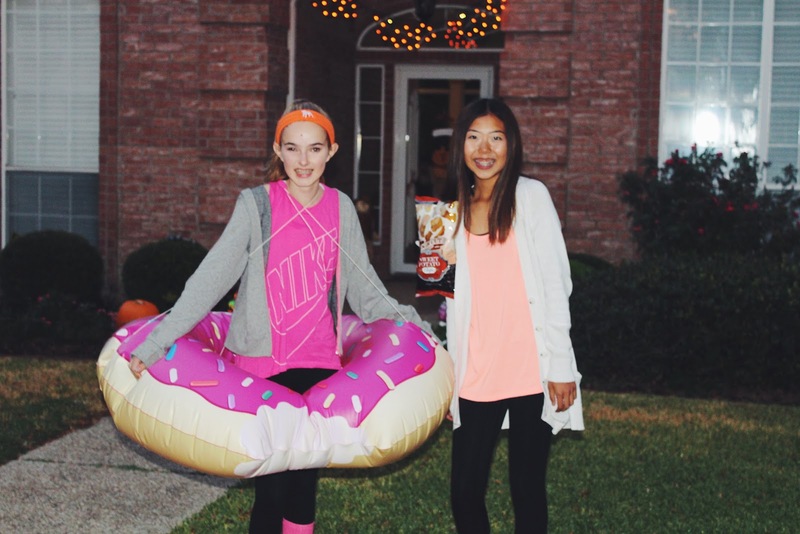 She was "a chip on my shoulder," and I was "Dunkin' Donuts." We thought our costumes were pretty creative, but nobody really got them... but it was still such a fun night even if I was in a candy coma by the end of it! 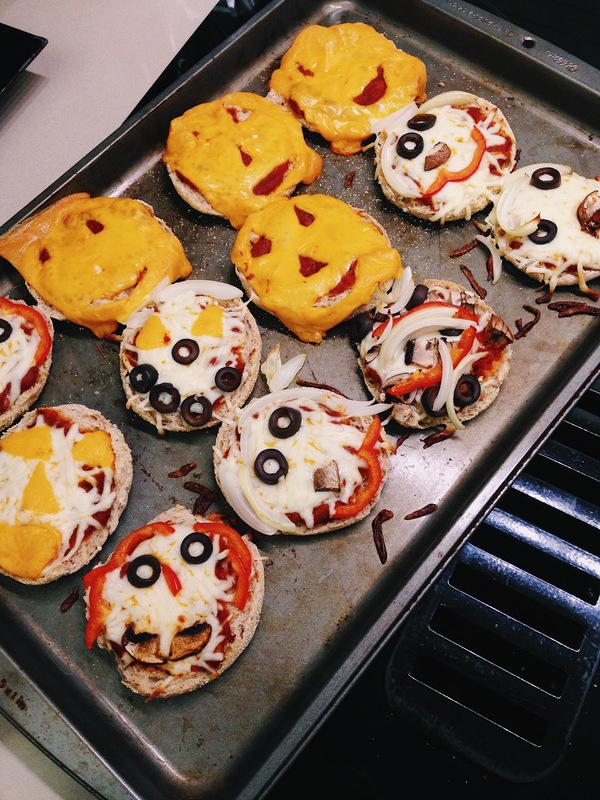 The night before Halloween, my family and I made these cute Jack'O'Lantern pizzas to get in the festive Halloween spirit! I posted them on my Instagram story, and a lot of y'all really seemed to like them, so I thought I would share them once again even though Halloween season is officially over. This was awhile back, but my dad, sister, and I went to the Texas State Fair a few weeks ago! 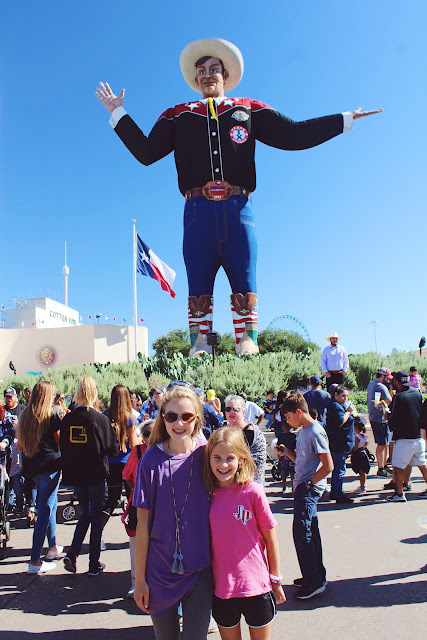 I hadn't been in seven or eight years, and my sister had never been, so we thought it was time that we made a trip out to Dallas to visit Big Tex. It was such a fun day filled with food (I tried fried cookie dough!! ), games, and sights to see!